John Olsen fine art giclee digital print titled The Sydney Sun made to an edition of 250 at Etching House Sydney and Melbourne. The John Olsen artwork titled “The Sydney Sun” is a hand signed and titled by John Olsen, the standard size has been completely exhausted and is no longer available, the last few were sold at the Etching House Melbourne Affordable Art Show May 2012, this large size Sydney Sun measuring 82x108cm series is now finished, the only Olsen Sydney Sun available is in the extra large sheet size of 107.5 and 142.1cm numbers are limited. Opening Night of the Etching House affordable Art show Melbourne May 2012 sees the last of the John Olsen The Sydney Sun Large size run out, the edition of 250 of the Sydney Sun reproductions have been one of the most popular works from the John Olsen archive fine art limited edition etching and digital print collection. Standard size John Olsen “The Sydney Sun 1965” edition of 250 is now finished at Etching House Sydney and Melbourne. Apart from the couple we have in archive 82x108cm, just a few extra-large size are available in the size of 107.5 and 142.1cm. The Sydney Sun fine art print has proven to be one of John Olsen’s one of the best and popular works to date. Also John Olsen fine art hand signed Etchings are available from Etching House, many etchings and prints are proving to be very popular, The John Olsen etching titled Jump 1, Jump 2, Lily Pond, Lily Pond 2 are drawing to a close. Not unlike The Sydney Sun print, the newly released 2017 John Olsen handmade hand signed etching prints titled Dancing Frog 2017 and Frog Pond 2017 are small limited editions and moving quickly as they represent extremely good value especially for John Olsen Etchings. The John Olsen artwork titled “The Sydney Sun” available from Etching House is a limited edition fine art reproduction print limited to only 250, The Sydney Sun prints are hand signed and titled John Olsen, the edition is now almost finished, the last few were sold at the Etching House Melbourne Affordable Art Show, this large size The Sydney Sun measuring 82x108cm series today is now sold out, the only Olsen Sydney Sun available is in the extra-large sheet size of 107.5 and 142.1cm but numbers are almost exhausted. Opening Night of the Etching House affordable Art show Melbourne May 2012 sees the last of the John Olsen The Sydney Sun Large size run out, the edition of 250 of the Sydney Sun reproductions have been one of the most popular works from the John Olsen archive fine art limited edition Giclee reproduction digital print collection. Sydney Sun fine art reproduction limited edition print at Etching House, this edition is about to close in 2012. This is a Limited Edition Fine Art Re -Production of the famous John Olsen painting titled “The Sydney Sun 1965”, this limited edition quality fine art print is signed and titled by John Olsen, the edition has been limited to 150 only and is nearly sold out may 2010, the sheet size is 82cm x 108cm, a larger version 107.5×142.1cm. The Extra-large Sydney Sun requires a special oversize mount board that only comes in rag mat, Etching House use only specialized professional framers. John Olsen felt these Australian fine art edition prints are a way for art lovers to be able acquire an affordable piece of his wonderful fine art works as there is only one original painting, works on paper or water colour. John Olsen’s traditional fine art etchings, prints, silkscreen’s and lithographs have so far made it possible to let the public enjoy his work, however, now with the Australian fine art edition quality prints they can enjoy his fine paintings and works on paper even more so at very affordable prices. Etching House has in stock 2 only John Olsen limited edition fine art print titled “The Sydney Sun 1965” the series is about to close and the few reaming have risen in price by 50%, please contact Etching House to check availability of Sydney Sun. The image titled “The Sydney Sun 1965″ is made on high quality Archer’s archival water colour paper using the best quality technology affordable, see details below. The Frog series is a famous signature edition as John Olsen fine art works on this subject has always been very popular, however selling out fast as is Sydney Sun. These archival fine art productions are printed using pigment inks on 100% cotton fibre mould made 256gsm stock which is pH neutral Acid and Lignin free. This bright white paper contains calcium carbonate as a buffer for atmospheric acids, Wilhelm Imaging Research. Inc of Grinnell, Iowa USA has conducted print permanence testing (conducted at 75T and 60% PH, measured at 450lux, in ‘standard” indoor display for 12 hours per day) on this paper stock, confirming minimum print life of at least 120 -1 30 years before any noticeable fading occurs under these conditions. Sydney Sun at Etching House -This fine art limited edition production of John Olsen’s painting Sydney Sun 1965 is in the collection of the National Gallery of Australia. 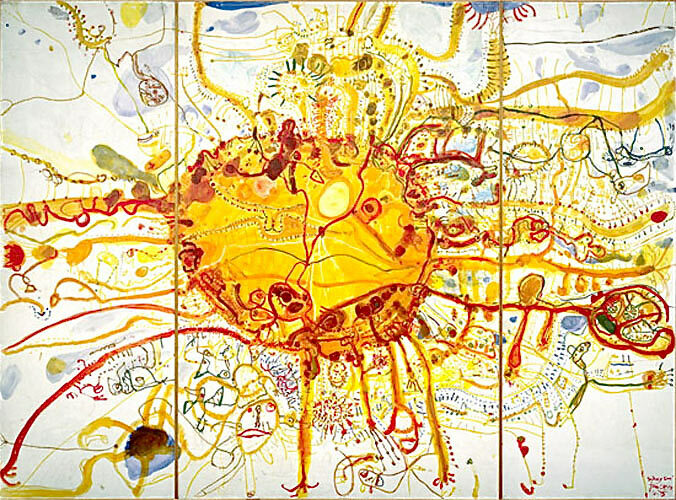 Sydney Sun 1965 is an important work in John Olsen’s artistic career and in the history of Australian art. The painting was undertaken at a time when the artist was receiving widespread acclaim for his innovative approach to painting and imaginative response to the local environment. The work made a considerable impact when it was first exhibited. Nothing quite like it had ever been seen before. The significance of Olsen’s approach was that he conveyed not only external visible reality but also a world that is felt and experienced. As the artist himself explained, he wanted to create an “all-at-once world; a totality of experience”. Sydney Sun on display in the National Gallery of Australia collection, Sydney Sun is a dramatic, large scale work in three panels. Sydney Sun was initially and brilliantly conceived as a ceiling painting, it is an optimistic, life-enhancing image, encompassing the artist’s passionate response to a sense of place and to the natural world. This is for those that can see it with their hearts very clearly conveyed in Sydney Sun through the magical vitality of the golden-orange sun: radiating warmth and energy to all living things. Deborah Hart, Senior Curator, Australian Painting and Sculpture. Sydney Sun limited edition fine art digital reproduction print hand signed by John Olsen is about to run out, the edition is finishing at Etching House. Sydney Sun by Olsen is the first edition fine art print to run out of stock other than the popular frogs. John Olsen Frog and Fly, Falling Frog and Frog pond prints take over from Sydney Sun as a new edition of Australian Iconic fine art work reproduction signed by John Olsen lower right. John Olsen a compassionate lover of nature and all its mysteries as well as John Olsen the philanthropist, his fine works and paintings will live on forever. The Flight to Broome, Tim Olsen Gallery Annex, Sydney. Australasia, United Kingdom, Europe and the United States of America. This is a Limited Edition Fine Art Re -Production of the famous John Olsen painting titled “The Sydney Sun 1965”, this limited edition quality fine art print is signed and titled by John Olsen, the edition has been limited to 150 only and is nearly sold out may 2010, the sheet size is 82cm x 108cm, a larger version 107.5×142.1cm. The Extra large Sydney Sun requires a special oversize mount board that only comes in rag mat, Etching House use only specialized professional framers. John Olsen felt these Australian fine art edition prints are a way for art lovers to be able acquire an affordable piece of his wonderful fine art works as there is only one original painting, works on paper or water colour. John Olsen’s traditional fine art etchings, prints, silkscreen’s and lithographs have so far made it possible to let the public enjoy his work, how ever, now with the Australian fine art edition quality prints they can enjoy his fine paintings and works on paper even more so at very affordable prices. The image titled “The Sydney Sun 1965” is made on high quality Archer’s archival water color paper using the best quality technology affordable, see details below. The Frog series is a famous signature edition as John Olsen fine art works on this subject has always been very popular, how ever selling out fast as is Sydney Sun. These archival fine art productions are printed using pigment inks on 100% cotton fiber mould made 256gsm stock which is pH neutral Acid and Lignin free. This bright white paper contains calcium carbonate as a buffer for atmospheric acids, Wilhelm Imaging Research. Inc of Grinnell, Iowa USA has conducted print permanence testing (conducted at 75T and 60% PH, measured at 450lux, in ‘standard” indoor display for 12 hours per day) on this paper stock, confirming minimum print life of at least 120 -1 30 years before any noticeable fading occurs under these conditions. Sydney Sun on display in the National Gallery of Australia collection, Sydney Sun is a dramatic, large scale work in three panels. Sydney Sun was initially and brilliantly conceived as a ceiling painting, it is an optimistic, life-enhancing image, encompassing the artist’s passionate response to a sense of place and to the natural world. This is for those that can see it with there hearts very clearly conveyed in Sydney Sun through the magical vitality of the golden-orange sun: radiating warmth and energy to all living things.